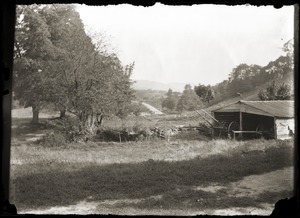 The artist Burt Vernon Brooks was one of the outstanding chroniclers of daily life in the Swift River Valley before it was inundated to create the Quabbin Reservoir. 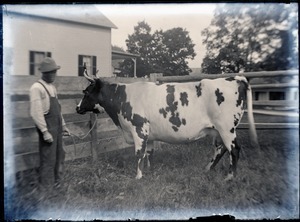 Born in Brimfield, Mass., in 1849 and raised in Monson, Brooks moved to Greenwich with his family in the 1870s, where he worked on the family farm. 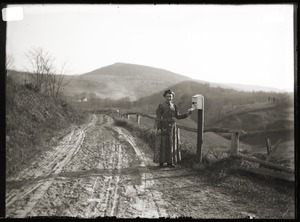 At some unclear point before he turned 40, Brooks became active as an artist, painting local homes and scenery and taking photographs of the landscape, residents, and daily life in the Quabbin region. A prolific photographer, he was, in the words of historian Donald W. Howe, "hardly ever seen without his camera strapped to his back," remaining active for decades. Three years after following his second wife to the west, Brooks died in Los Angeles in 1934. 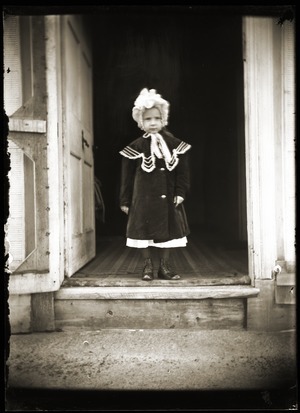 The great majority of the 92 photographs in this collection are 5x7" dry plate glass negatives taken by Brooks in the earliest years of the twentieth century, documenting the houses and people of Greenwich. 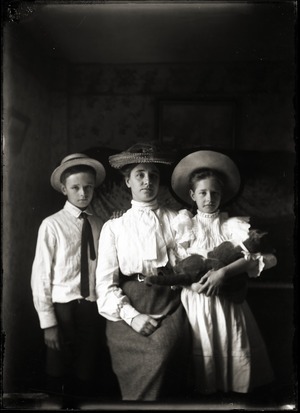 Brooks' work includes landscapes, houses, and a significant series of images of the Hillside School, but some of his best works are studio portraits, images of people at home or with their carriages, and posed scenes of children at play or at work. 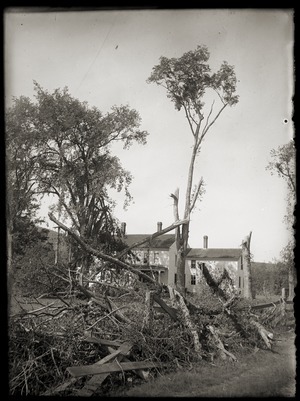 The collection also includes eight images by Brooks at Enfield, Greenwich, and Dana that are the property of the Swift River Valley Historical Society, and six images taken by Chetwynd and Pike in the Quabbin region to document properties slated for removal. 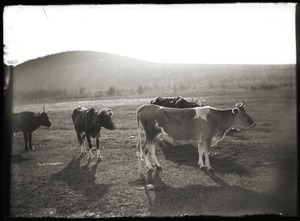 Burt Vernon Brooks left a remarkable visual record of daily life in the Swift River Valley, Massachusetts, in the years before it was inundated to create the Quabbin Reservoir. 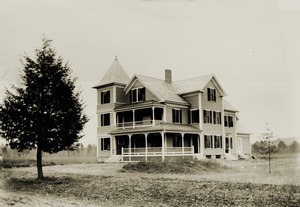 Born in Brimfield on May 22, 1849, the son of Benjamin (1813-1888) and Charlotte Emerson Brooks (1813-1895), Burt was raised in a home perched on the lower rungs of the economic ladder. 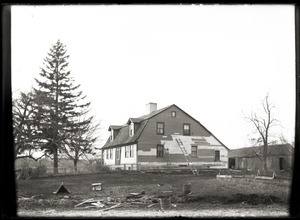 His father, a farm laborer and later farmer, never acquired significant taxable property, even by the standards of his poor neighbors, and the family's fortunes improved little after they relocated from Monson, where they had been living, to the Swift River Valley town of Greenwich in the spring of 1879, according to Quabbin historian J.R. Greene. 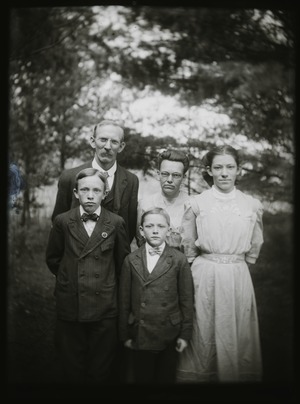 Whether in spite of poverty, or because of it, family was a center of Brooks' life and he never strayed far from his parents or four siblings, living with his parents until he was well into his forties and only separating from them when his mother died. Both of Brooks's brothers died young. Abner Shaw Brooks (1841-1863) was only 22 when he was killed in action during the Civil War as a member of the 25th Connecticut Infantry, falling in the Battle of Irish Bend. A younger brother, Orson Francis Brooks, died even younger at the age of six on Aug. 12, 1857. Brooks' sisters were more fortunate. 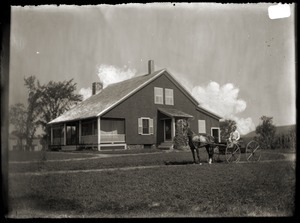 Anna Mariah (1837-1904), the eldest of the siblings, married a shoemaker, T. Walter Deming (1832-1885) in 1852, and had the distinction of moving the furthest afield, barely, settling in the neighboring town of Palmer. The younger sister, Martha Jane (1838-1912), married twice: first to Miner King, with whom she had two children, and then, in 1876, to a carpenter and English immigrant, William H. Fewell. 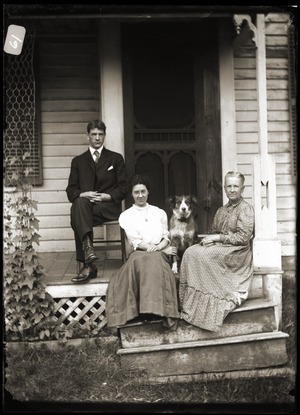 Through both marriages, at least until her parents' deaths, Martha remained at home. 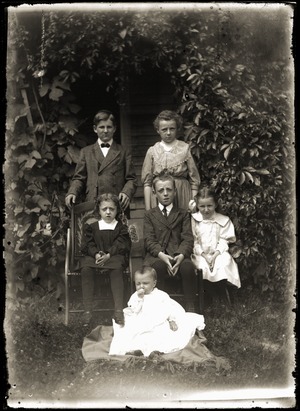 She, her husband, and sons William (who died young) and Edgar, lived with or next door to Burt for over thirty years, even though Greene notes that according to oral tradition, Burt and Edgar despised one another. Even in death, the family remained close. 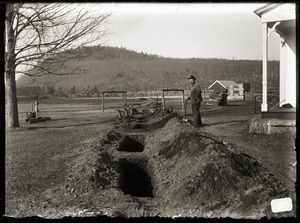 Most of the family's graves were removed together from Greenwich when the Swift River Valley was flooded and they were reinterred in Walter Deming's family lot in Monson's Moulton Hill Cemetery. Abner and Orson share a single stone, as do Anna and Walter, whose stone is inscribed with the Spiritualist motto "passed to spirit life." Burt Brooks married twice, relatively late in life, with both marriages to much younger women. 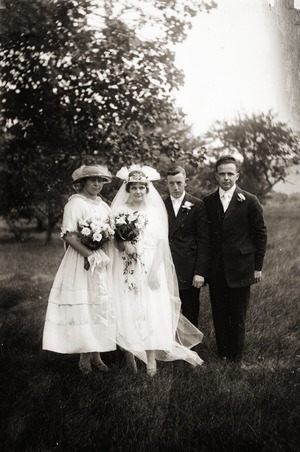 At the age of 34, he married Gertrude F. Childs (1868-1907), a dressmaker from Dana who was nearly twenty years his junior, and in September 1913, he married Ina Amelia Gamwell (1883-1983), who was nearly 35 years younger. Neither marriage resulted in children. Beyond these simple facts of family, however, many details of Brooks' life remain unclear. 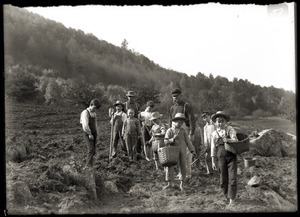 Although listed as a farm laborer in the 1880 census, he and his family found income where they could, including taking in boarders to their crowded house. 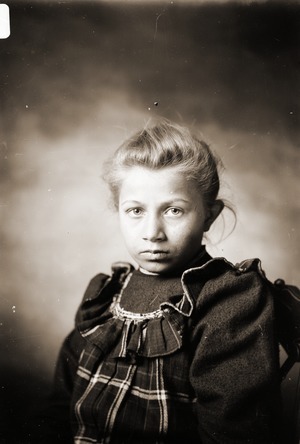 In 1880, they boarded Rispah Chamberlain Powers (1803-1883), an elderly widow who was deemed "demented" (and who had formerly been an inmate at the state asylum in Worcester), and in 1900, he supported an 11 year old boarder who Greene argues may have been a "state orphan." 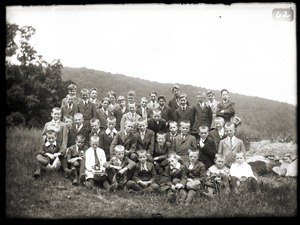 In 1920, he and Ina boarded girls, also apparently orphans or abandoned children, one of whom was later recorded residing at the Lancaster State Industrial School. 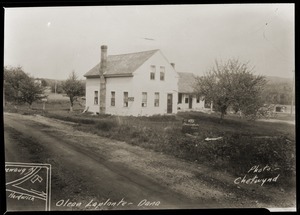 Greene adds that Brooks oversaw the town poor farm in Dana in 1891-92. Flexibility in making ends meet was a necessary part of a poor person's life, of course, but Brooks stood out for pursuing an unusual occupation not typically associated with life in a small rural town: art. Precisely when he took an interest in the subject or whether, how, or with whom he trained remains unknown, but by the age of forty, Brooks was making money from his talents, and by 1900, he regularly listed himself as a painter -- or sometimes a landscape painter. His first artistic job probably predated 1887, when the Greenwich Selectmen paid him $35 to produce a map of town, and there are suggestions that Brooks may have taken up photography by the same time. Twenty years later, he was thanked in the town's annual report for presenting "pictures" of the town's schoolhouses, church, and two villages to the local library, and at least some of his surviving photographs can confidently be dated to prior to the turn of the century. 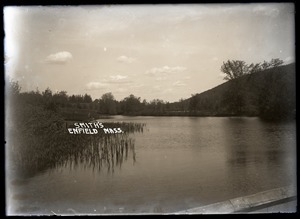 He supplemented his income after the turn of the century by selling photographic postcards of Swift River Valley scenery. As both painter and photographer, Brooks was known for his depictions of the landscape and buildings of Greenwich, but his work covered a broader range, including studio portraits, images of families, farm and domestic animals, work places, and carefully posed "genre" scenes. 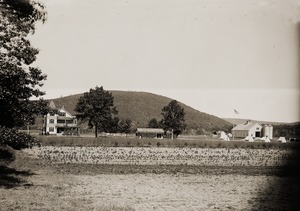 In his history Quabbin: The Lost Valley, Donald Howe recalled that Brooks cut a striking figure in town, with his high starched collar, bowler hat, and full beard, and that he was "hardly ever seen without his camera strapped to his back." The eccentric artist, Howe records, painted his own coffin during the "violent" flu epidemic of 1918-1919, adorning it with scenes from life in Greenwich. Brooks was active as an artist well into his 70s, but by the time of the census of 1930, the then-80 year old man was recorded as living alone in a rooming house in Springfield, his wife Ina having moved to Los Angeles. In that census, Burt listed himself as married, while Ina, living with a lodger named John Finch, indicated she was divorced. Whatever the circumstances, Burt reportedly followed Ina to Los Angeles in the following year, toting his painted coffin with him, and he died there on April 24, 1934. Despite his wishes to be buried in his coffin, he was cremated, and the ashes were returned to Greenwich. He shares a stone with his first wife, though his own death date was never inscribed. Ina eventually married a chauffeur, Frederick Weston Finch, and lived in northern California until her death in 1983 at the age of 99. 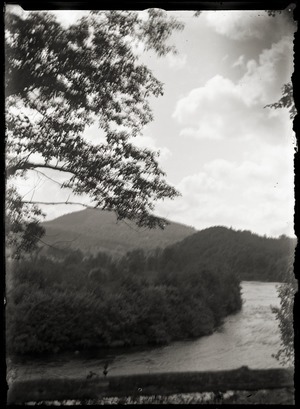 The photographs in the Brooks collection represent a significant assemblage of works by one of the most important chroniclers of the Swift River Valley. 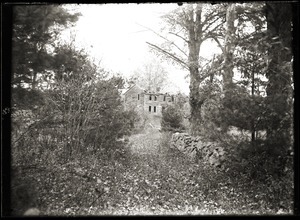 The heart of the collection consists of 75 glass plate negatives, all but one of which is 5x7", representing the full range of Brooks' work between ca.1899 and 1920, from scenic views of Greenwich Plain and Mount Pomeroy to images of the Hillside School and its students, houses and families in Greenwich, portraits of Brooks' relatives, and careful genre images depicting children at play and people at work. 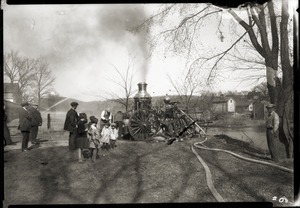 Added to the collection are six negatives on flexible stock: one of these (depicting an old fire engine in Enfield, Mass.) 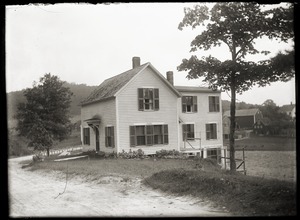 may be by Brooks, however the rest were taken by Chetwynd or Pike to document buildings in the Quabbin towns that were slated for removal. 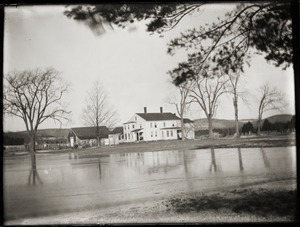 Eight other 5x7" glass plate negatives, all apparently by Brooks, are included in digital form only: the original glass plates are held by the Swift River Valley Historical Society, New Salem. 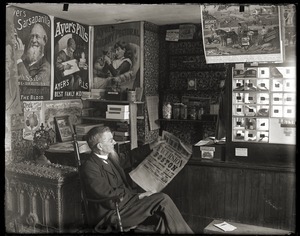 Although none of Brooks' images is clearly dated, a few contain internal clues that set temporal boundaries: an image of a man in Enfield reading a broadside can be affirmatively dated to 1889 based on a calendar in the background; the image of the infant Elizabeth Adaline Edwards must have been taken shortly after her birth in 1899; and the photograph of Clarence and Marion Hall was taken at their wedding on Sept. 6, 1920. We have assigned an approximate date of 1910 for all images in which internal clues are lacking, although the range of dates is surely wider. In most cases, we have retained the numbering system used by the donors of the images, assigning numbers at the end of the sequence for which they had not accounted or for images where they had assigned duplicate numbers. 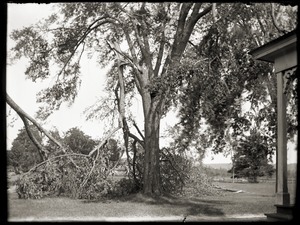 The collection includes two images for which there are second, slightly variant negatives: nos. 19and 19b and 62 and 62b. Man seated in the general store, Enfield, reading a broadside for a New York and New England Railroad excursion to Boston and Nantasket Beach. Photo may not be by Brooks. Small crowd gathered around a demonstration of the antique steamer fire engine. 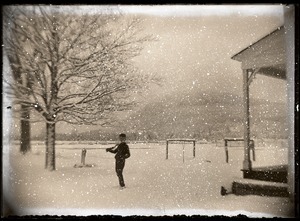 Portrait of young boy standing outside in falling snow (retouched by Brooks) with rifle over shoulder. N.B. 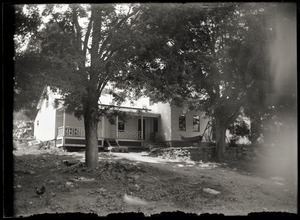 : scene taken near the front porch of the Brooks-Fewell house (see the corbel on porch support, Mount Pomeroy in distant background. 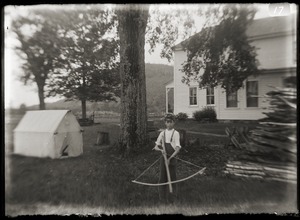 Young boy with homemade crossbow posed in front of the Brooks-Fewell house. Image of horse and buggy pulled up in front of Brooks-Fewell house. View of flooded plain in front of Brooks-Fewell home. 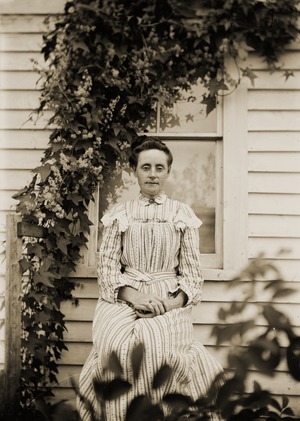 Portrait of Burt Brooks' sister-in-law seated in front of a ivy-covered window. 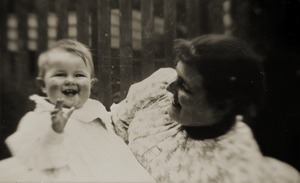 Portrait of Olive Edwards, wife of Charles (also sister of Gertrude Childs, wife of Burt Brooks), with smiling infant. Elizabeth was born Sept. 1898. 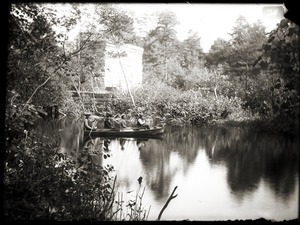 Young woman and children wading in pond, Brooks-Fewell house in background. 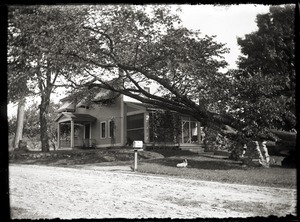 View of fallen trees in front of Brooks-Fewell home. View of snow and frozen-over pond. 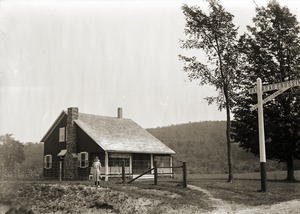 Possibly Burt Brooks' house (see similar fence in painting of Brooks house in Howe, Quabbin: the Lost Valley, p.330. 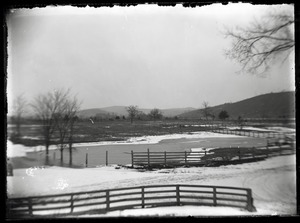 View of fence, snow, and frozen pond adjacent to the Brooks-Fewell house. See also Brooks no. 079. 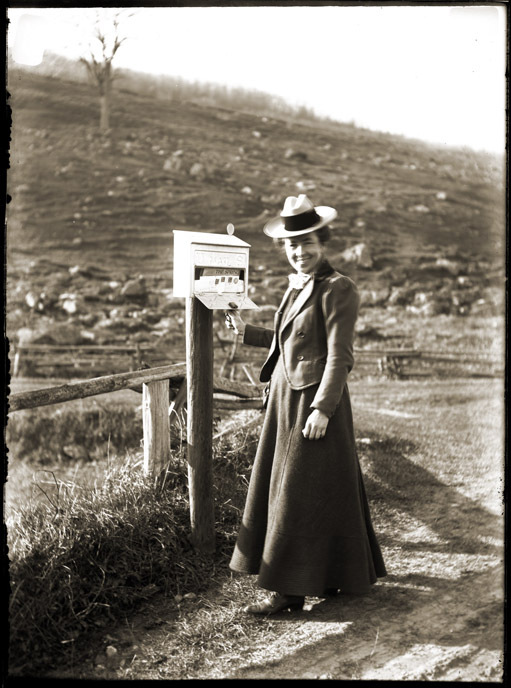 Woman in fashionable hat, standing beside mailbox; the letters in the mailbox are addressed to Miss Pansy Allen in Palmer, [Mass.]. 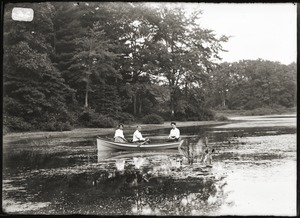 Image of a man rowing two women across a pond. 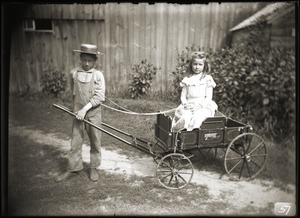 Young boy in straw hat pulling a girl seated in a toy wagon. 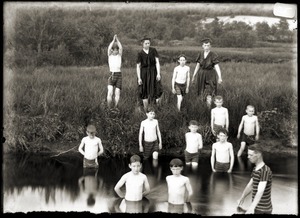 Group of ten boys in bathing suits gathered in pond with two women (teachers?) and a man overseeing them. 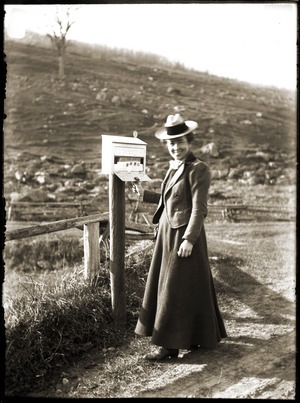 Portrait of woman standing beside rural mailbox. 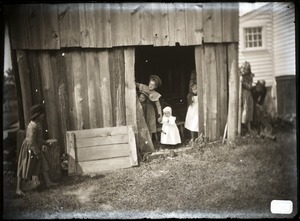 Posed scene of seven children playing around a wooden shed. 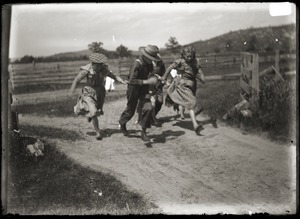 Two boys and three girls running down a dirt road. Bride and groom posed with maid of honor and best man. 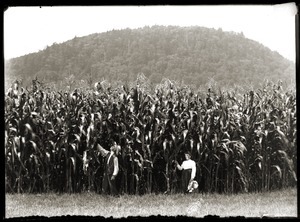 Man and woman standing in cornfield with tall stalks. 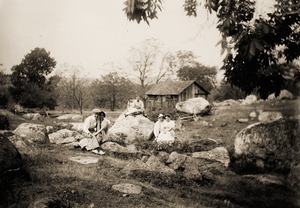 Three unidentified couples seated arm-in-arm, barn in background. 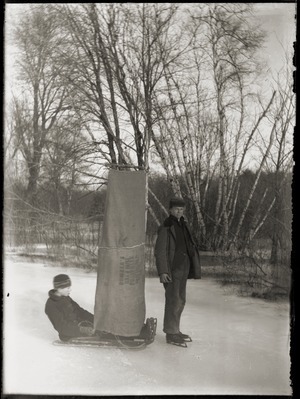 Two young men, one on ice skates, with homemade ice boat with sail made from burlap fertilizer sacks. See also Brooks image no. 20. 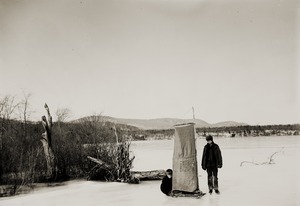 Two boys on frozen pond with homemade ice sailing craft. 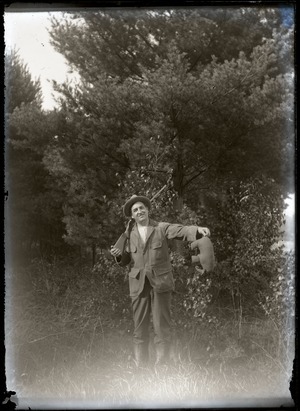 Gag photo of unidentified man in hunting attire, gun over shoulder, holding toy elephant by the tail. Two men and two women boating across a pond . 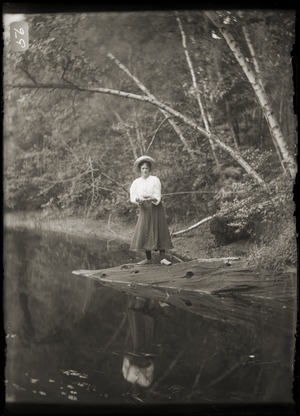 Unidentified woman fishing by the side of a pond. 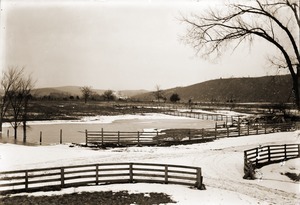 View of split rail fence and fields, barn in foreground; possibly Hillside School. 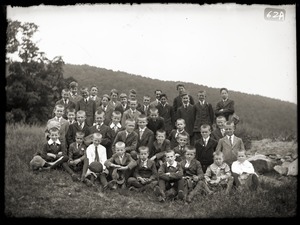 Group of ten boys (possibly Hillside School?) and supervisors in a field, planting potatoes. 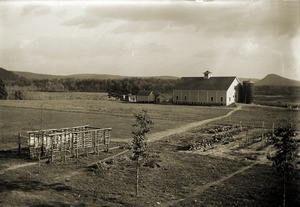 First of three views of the barn and grounds of the Hillside School, founded by Charlotte Drinkwater and Mary Drinkwater Warren on their farm in Greenwich, Massachusetts, as a self-sustaining school for poor and homeless boys. 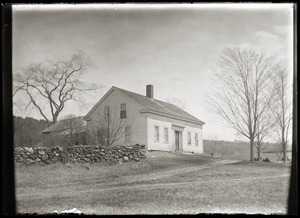 Second of three views of the barn and grounds of the Hillside School, founded by Charlotte Drinkwater and Mary Drinkwater Warren on their farm in Greenwich, Massachusetts, as a self-sustaining school for poor and homeless boys. 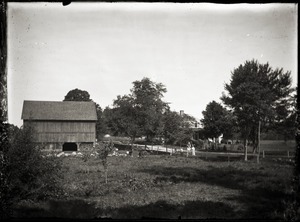 Third of three views of the barn and grounds of the Hillside School, founded by Charlotte Drinkwater and Mary Drinkwater Warren on their farm in Greenwich, Massachusetts, as a self-sustaining school for poor and homeless boys. Unidentified building at Hillside School. See image of students on front steps of this building at muph060-b003-i090 and muph060-b004-i124. View of building at Hillside School. See image of students on front steps f this building in Brooks no. 90 and no. 112. 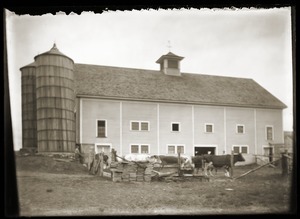 View from the side, with barn in background. View from the front, looking onto front porch. 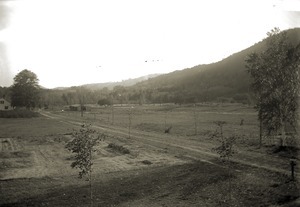 View of newly planted fields in front of Hillside campus. 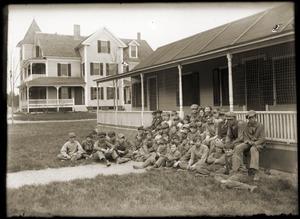 Group of Hillside School boys posed on steps of a building, main school building in background. 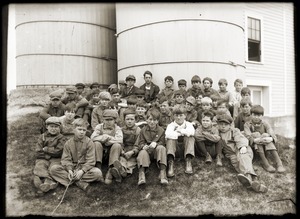 Group of Hillside School boys seated in front of twin silos adjoining school barn. 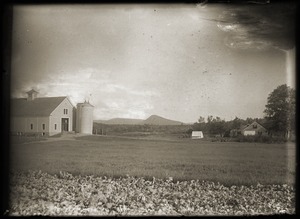 View of property at Hillside School, major barn and twin silos on the left. 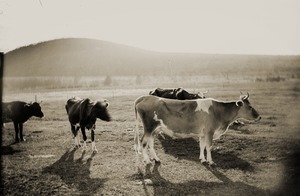 Cattle by the side of the large barn at Hillside School (twin silos at left). 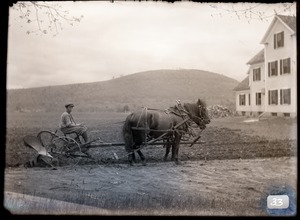 Man plowing fields at Hillside with two horse team. 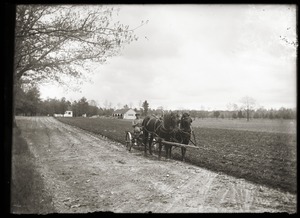 View of farm boy with two-horse team plowing fields at Hillside School. See different image of same boy and plow in Brooks no. 33. 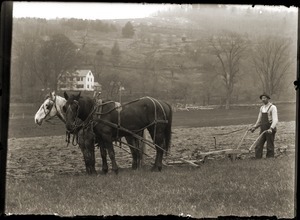 A farmer with two-horse team, plowing a field. 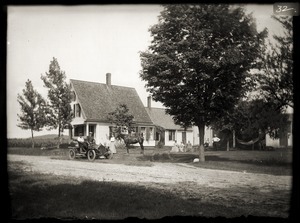 Automobile with two passengers pulled up in front of house; horse standing nearby. 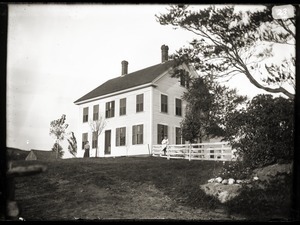 Unidentified Cape-style house with stone wall. 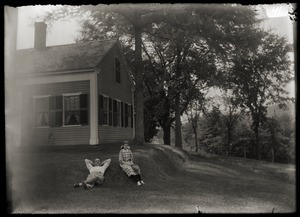 Man and young relaxing in front of house. Note: the same girl appears in images 11, 14, and 44, and the house is that depicted in image 10. 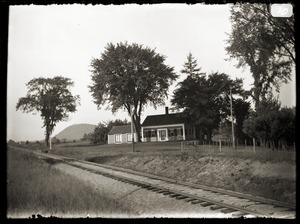 Young girl in gingham dress posed in front of house of Edward S. Green and his wife Nellie L. (Dufraine) Green; railroad crossing sign in foreground. Note: the same girl appears in images 11, 41, and 44. 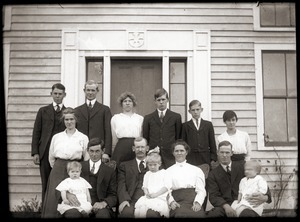 Family group seated in front of door to house: older couple in center with nine grown children and three infants. View of fine house and fields, set among trees. 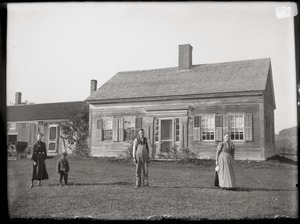 Family posed by side of house, Mount Pomeroy looming behind. 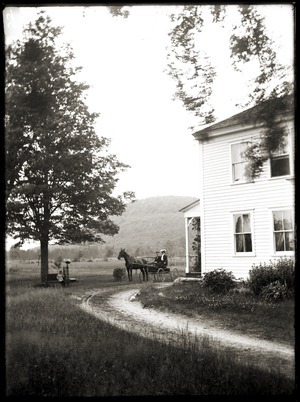 Rider, horse and buggy pulled up in front of house -- probably the house of Ed and Nellie Green. 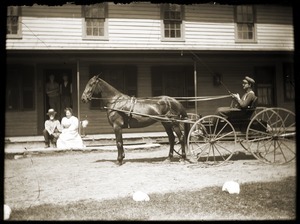 Rider, horse and buggy pulled up in front of house -- probably that of Ed and Nellie Green. 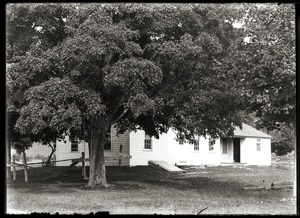 View of unidentified house behind large shade tree. 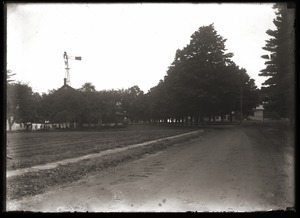 View of unidentified house and grounds buy railroad crossing, including edge of corn field. Same house is depicted in Brooks nos. 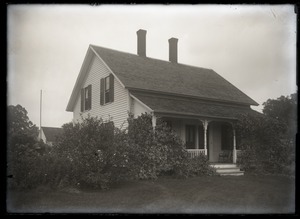 11-14, where it is identified as house of Edward S. Green and his wife Nellie L. (Dufraine) Green. 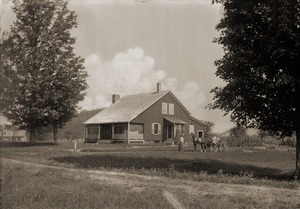 View of large house beside lake (possibly Quabbin Lake). 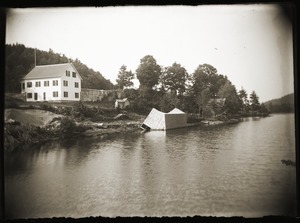 Boathouse or outbuilding by shore in foreground appears in disrepair. 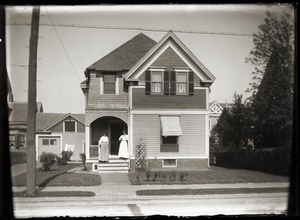 View of two women at front entrance to unidentified house in town. 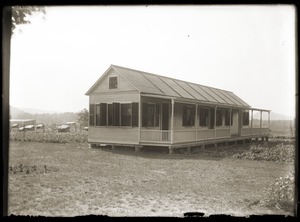 View of unidentified house with gambrel roof and two dormers, and adjacent yard. 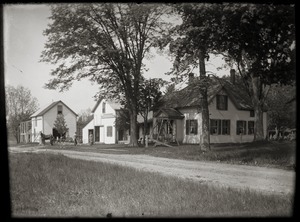 View of house and shop along street, with woman in front, horse and buckboard, and man pushing a reel mower. 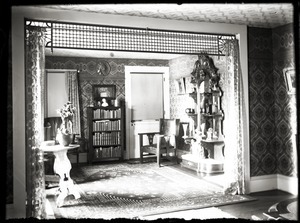 Interior of unidentified, but elaborate house. Duplicate of image at Brooks no. 43. 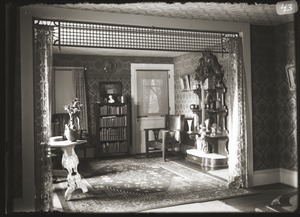 Interior of elaborate, but unidentified house. 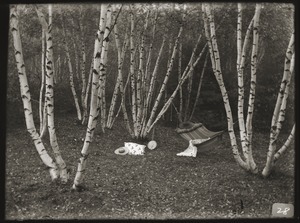 View of a large tree with nearly horizontal branches next to house with striped awnings; dog lying on grass in foreground. Small, well-tended Cape Cod house. Note: the house is the same as depicted in image 41. Ruins of old house, roof collapsed, engulfed by woods. Possibly Greenwich. 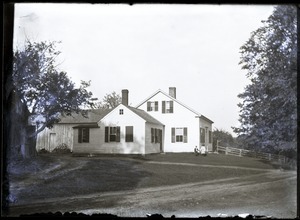 Image of an elegant house with unidentified woman standing before front door and young girl perched on a fence nearby. Family (parents and two children?) standing in front of Cape Cod-style house. 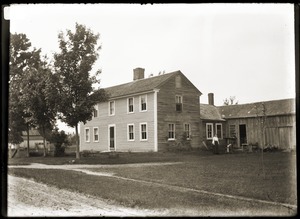 View of older house with center chimney, woman and man standing in side yard. 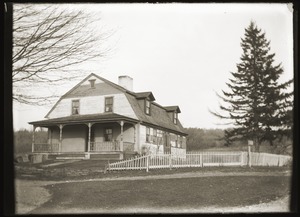 The house resembles "Dark Corners," which Brooks depicted in a painting (see Howe, Quabbin: the Lost Valley, p.330). 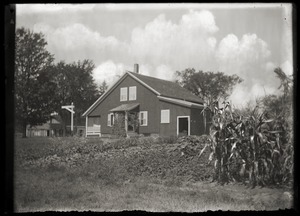 Image of small house built into slope, fields behind. 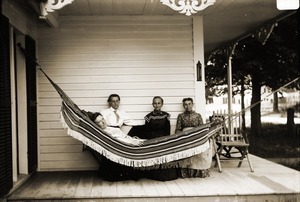 Image of front of house with ell and porch, chickens, terracing, and a hammock. Image of house being painted, ladders propped against the side. 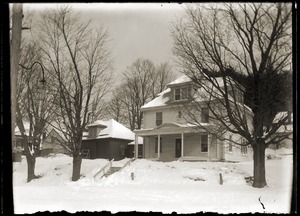 View of unidentified house in town, under snow. 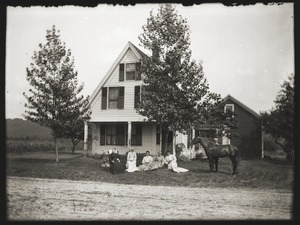 Group of five women posed in front of house with horse nearby. 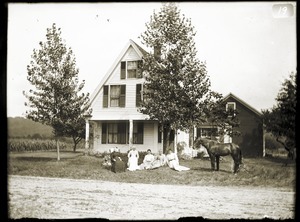 Alternate shot of group of five women posed in front of house with horse nearby. Cape-style house with ells. Possibly Greenwich. 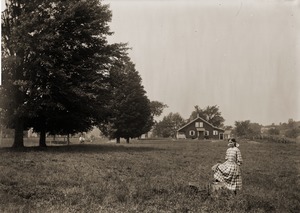 Image of young girl in gingham dress stanidng in a field in front of a house -- probably that of Ed and Nellie Green. Note: the same girl appears in images 14, 41, and 44. 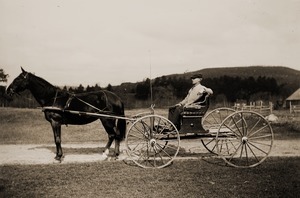 Driver holding reigns to sport buggy, two people seated on steps in background. Probably taken at Riverside Hotel, Greenwich (see Howes, Quabbin, the Lost Valley, p. 318). 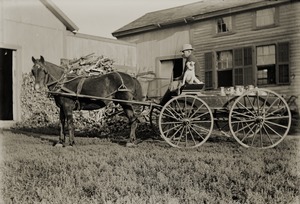 Unidentified man with walrus mustache, dog, seated in buckboard wagon. The wagon carries ten quart jugs to pick up cream from farmers. 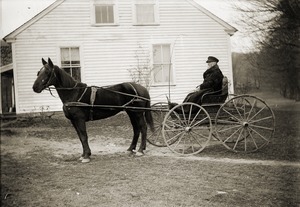 Man in carriage wearing a thick coat, parked in front of unidentified house. King, seated in a sporty carriage. 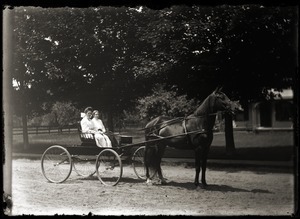 Two women seated in a buggy, reins in hand. 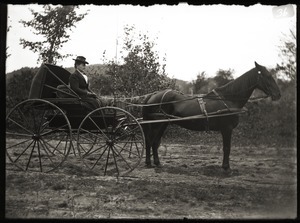 Woman in carriage, halted in a lane. 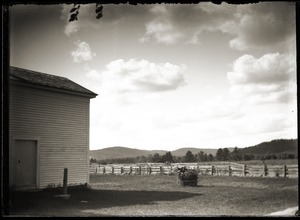 View of cattle grazing next to large wooden barn and across road from house, obscured by trees. View from opposite hill of sizable town with brick buildings. 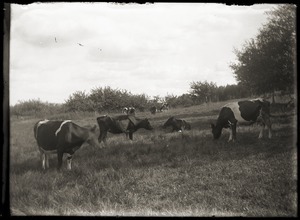 Small herd of dairy cows in pasture, Mt. Pomeroy in background. 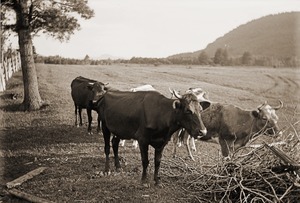 View of cattle grazing on sloped field. 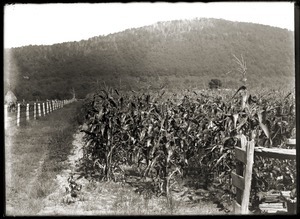 Corn field at base of Mount Pomeroy. 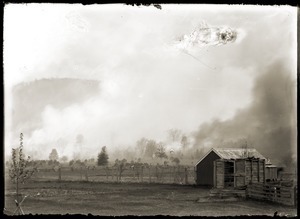 Shed, probably for animals, with fields behind burning. 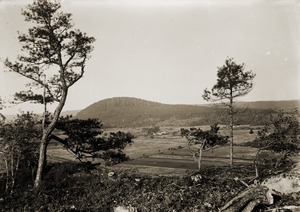 Panoramic view across the Swift River Valley. 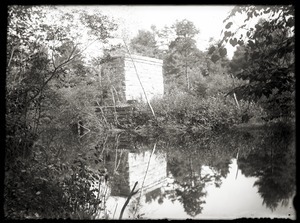 View of masonry structure adjacent to a pond. Same structure appears in Brooks no. 24. View of the Middle Branch of the Swift River as it passes by the base of Mt. Pomeroy. 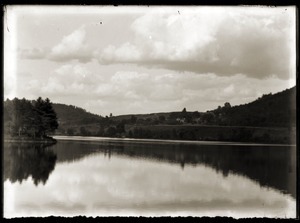 View of Middle Branch of Swift River, Mount Pomeroy in background. 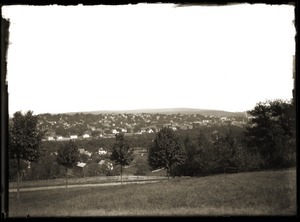 Panoramic view of Swift River Valley. 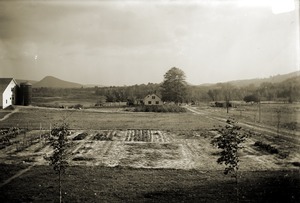 Fields planted by unidentified home. View across Quabbin Lake (?). 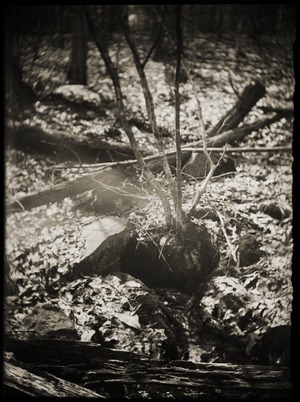 Image of roots and lower branches of a small tree, growing amongst large rocks. Birdhouse(?) built onto branches of a large elm tree. 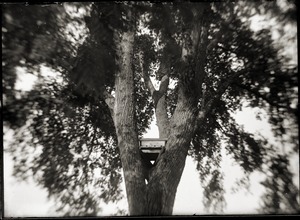 Image of elm tree (birdhouse? attached) showing possible storm damage. 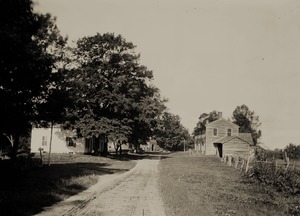 View down lane, with houses on either side. 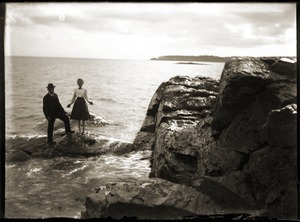 Man and woman standing on a spit of rocky land by sea coast, location unidentified. 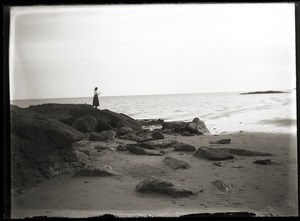 Unidentified woman looking out to sea from rocky coast. 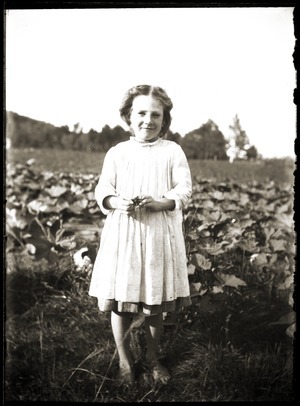 Barefoot girl standing in field. 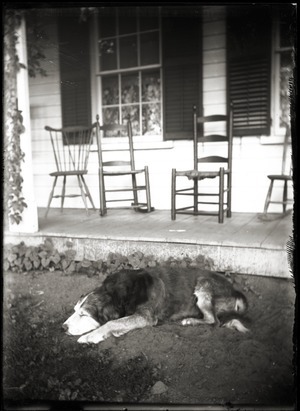 View of sleeping dog in front of unidentified porch. 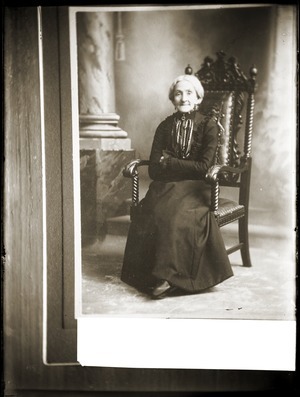 Copy print made of full length studio portrait of elderly woman (possibly Charlotte Brooks?) seated in chair. 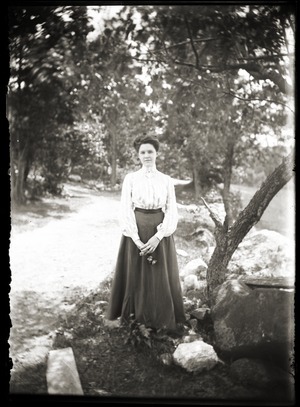 Original image appears to have been a cabinet card. 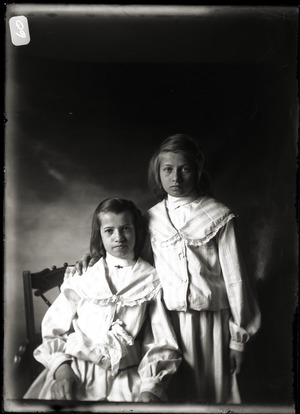 Studio portrait of the Billings sisters. Half-length studio portrait of young Emma Billings. 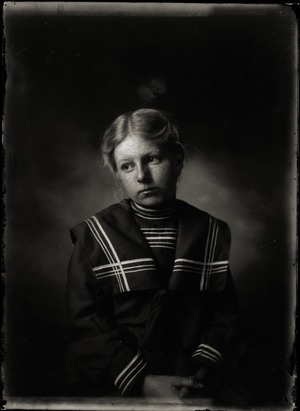 Studio portrait of young Emma Billings. 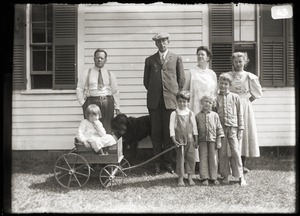 Unidentified group of two men, two women, and a dog, with four children (one posed in toy wagon) standing by a house. Portrait of man, woman, and three children. 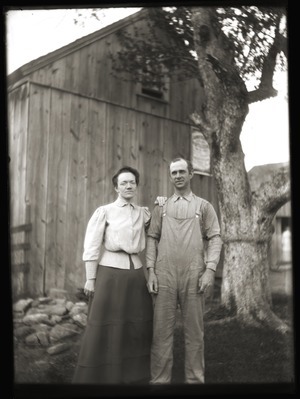 Portrait of couple (tentatively identified as Fred and Elizabeth Alden) standing in front of a barn. 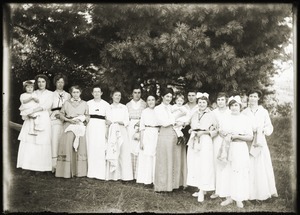 Portrait of unidentified group of women and children, standing beneath pines. 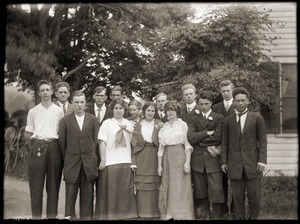 Group portrait of ten men and four women, all unidentified. 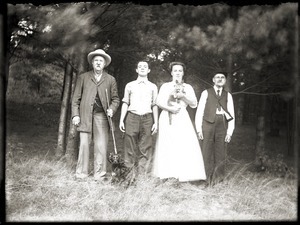 A young man, two older men, a spaniel, and woman holding a cat, all standing in front of white pines. 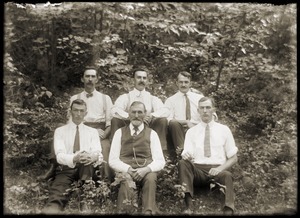 Portrait of elderly man and five younger men, all seated, in front of woods. 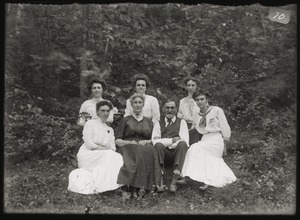 Unidentified group, but possibly a couple and five daughters(?). 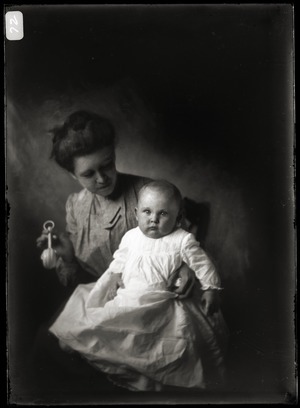 Studio portrait of mother, holding a rattle, and her infant. 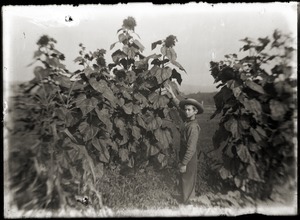 Image of a young boy in straw hat, standing among sunflowers taller than he. 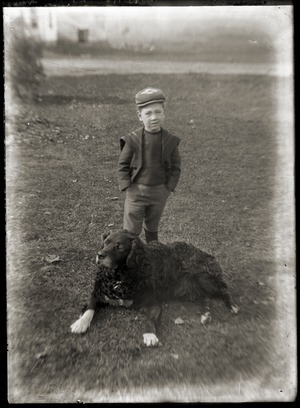 Full length portrait of boy, hands in pocket, standing on lawn with a large dog. 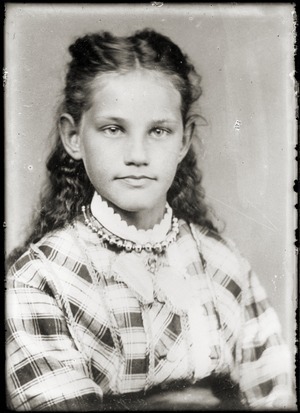 Half-length portrait of young girl with lace collar and plaid dress. Girl also appears in Brooks images 11, 14, 41, and 44. 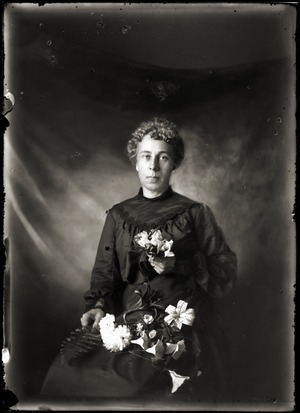 3/4 length studio portrait of young woman holding bouquet of flowers. 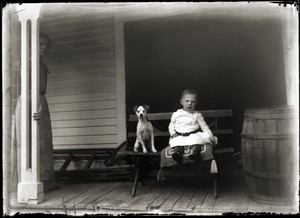 Image of young child strapped to a bench on a porch and seated next to a dog; mother standing behind a pillar at far left. 3/4 length studio portrait of a woman with a boy in boater and tie, and girl holding a cat. 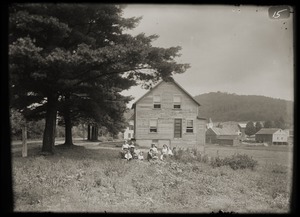 Portrait of six children, presumably related, in front of plant-covered house. 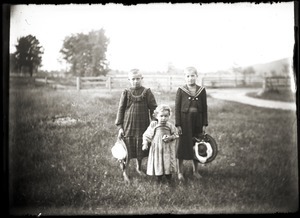 Two boys wearing dresses, women's hats in hand, posed with an infant between. 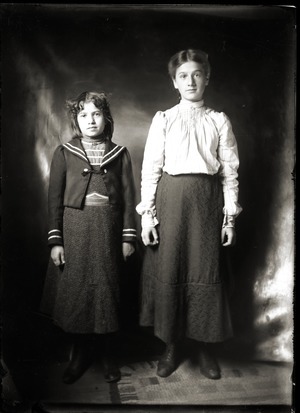 Full length studio portrait of two girls. N.B. : the younger girl is wearing the same outfit as one of the boys in Brooks image no. 159. 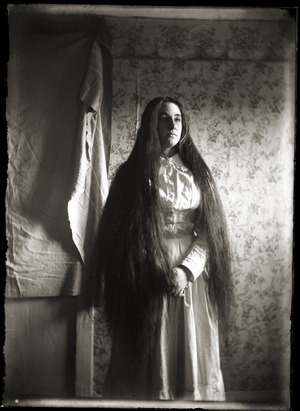 3/4 length portrait of a woman with exceptionally long hair. 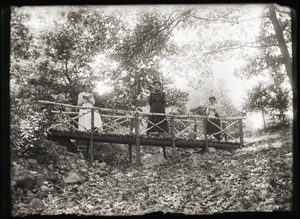 Three women standing on a bridge made of birch poles and logs: one woman is reading a book, another embroidering. 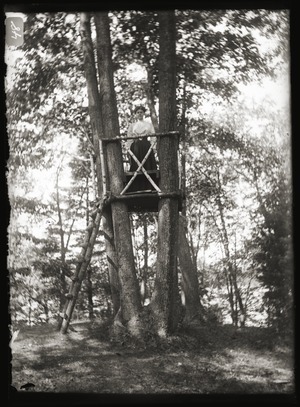 Portrait of unidentified woman standing in a treehouse. 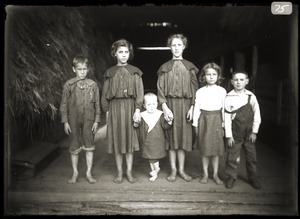 Group of barefoot children posed in doorway to a barn (? ), two older girls wearing capes. 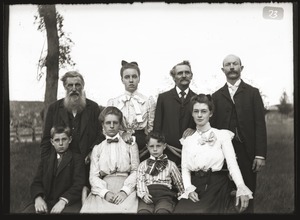 Posed portrait of family, possibly representing three or four generations. 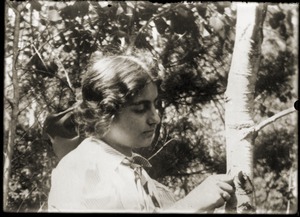 Close-up portrait of unidentified woman using a pen knife to carve words into a small birch tree. 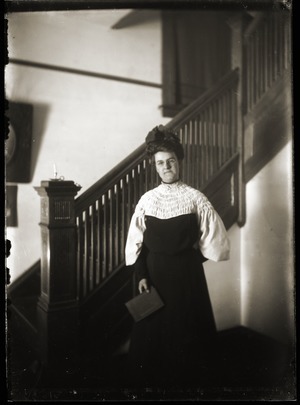 Portrait of unidentified woman, wearing an ornate hat, standing in front of an interior staircase. 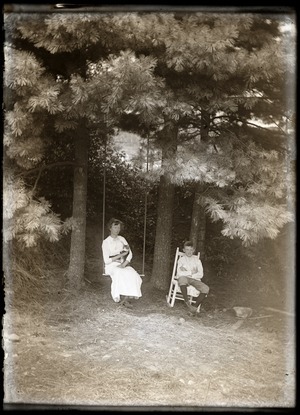 Unidentified woman seated on a swing, cat in arms, seated next to young boy on rocking chair beneath the pines. 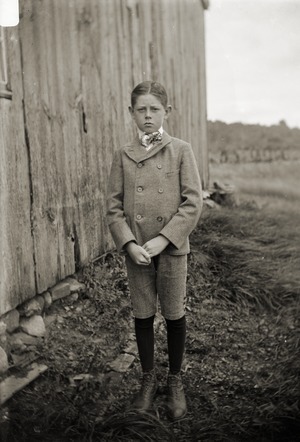 Stiffly-posed boy in Sunday best. 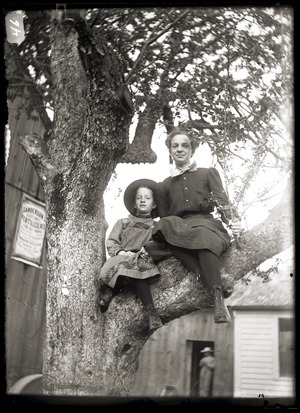 Portrait of two girls perched in a tree, possibly the daughters of Fred and Elizabeth Alden (Helen M. and Grace S.). 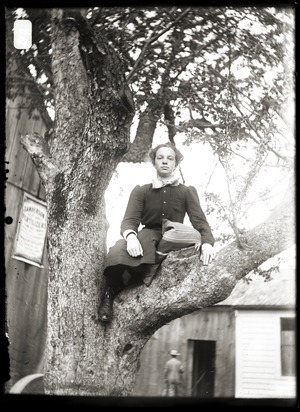 Portrait of young girl perched in a tree, possibly the daughter of Fred and Elizabeth Alden (Helen M.). Full length portrait of young woman, holding flower. 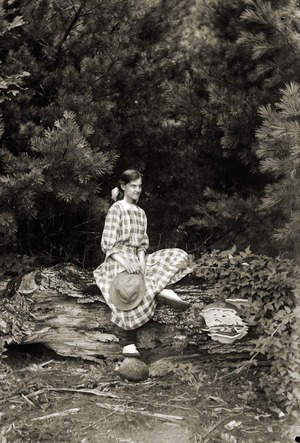 Portrait of girl in a gingham dress, seated on a log. Note: the same girl appears in images 11, 14, and 41. 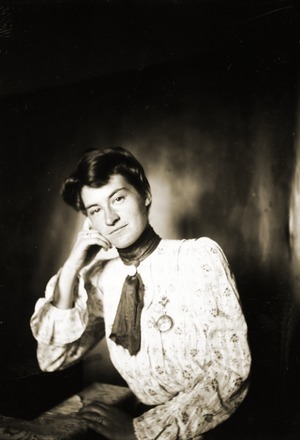 Studio portrait of young woman in contemplative pose. Winter scene of Emma and Margaret Billings with milk pails. 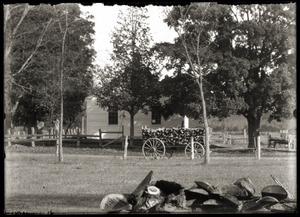 Buckboard loaded with fire wood in front of unidentified home. 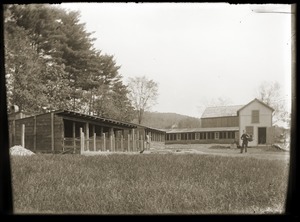 Man standing in front of animal enclosures and barn at unidentified farm. 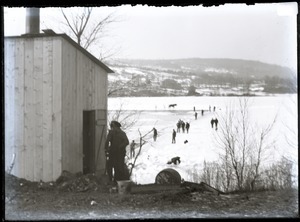 View of ice harvesting from warming shack. 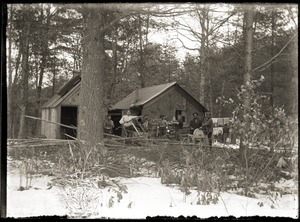 Group of seven men in the woods in winter, standing in front of shanty. One man plays accordion, another holds a buck saw, and two operate a sharpening stone. See also Brooks image 141. 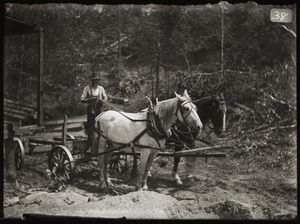 Unidentified man standing in wagon, hauling wood. 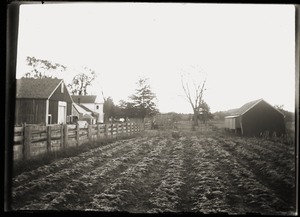 View of shed and farm equipment at unidentified farm. 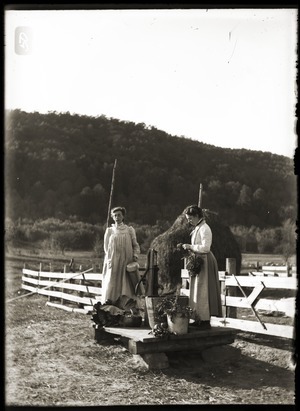 Two women rinsing beets and other vegetables. 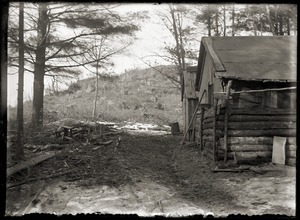 Image of shanty at lumber camp. See also Brooks no. 92. View of house taken for MDWC for survey of Quabbin properties (R-433 #689). 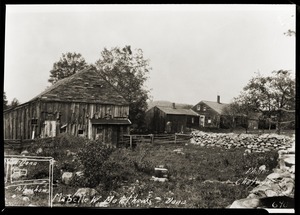 View of rear of house and outbuildings taken for MDWC for survey of Quabbin properties (R-472 #690). 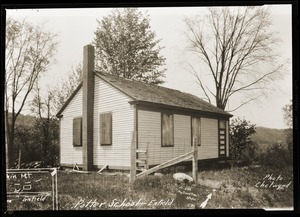 View of school house (R-249 #675). 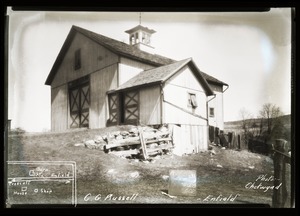 View of barn with inclined entrance (R-268-31 #602). 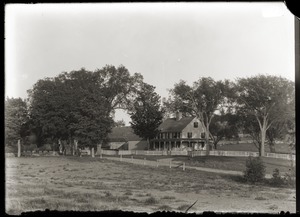 View of house and grounds (R-509 #1887). View of kiln and out-buildings (R-470 #1206). Original housed at the Swift River Valley Historical Society, New Salem, Mass. View down Main Street, with laundry drying on a line and windmill in background. 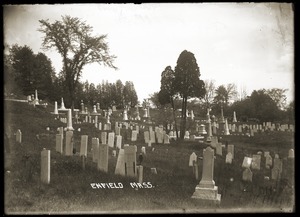 View of headstones in Enfield Cemetery. 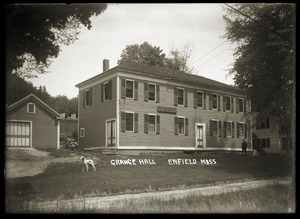 View of man and dog standing in front of Grange Hall. View of house from front. 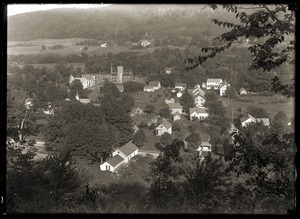 Bird's eye view of Smith's Village. 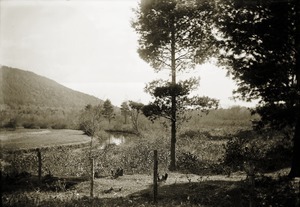 View of pond at Smith's Village. 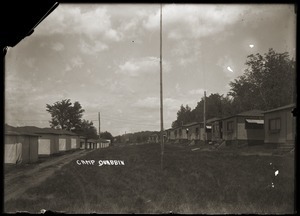 View down row of cabins and tents. 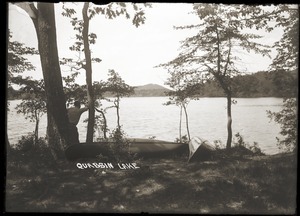 View of a man and canoe beside Quabbin Lake. Gift of Friends of Quabbin through Gene Theroux, Paul Godfrey, and Les Campbell, June 2014. All images in the collection have been scanned and are available online through our digital repository, Credo. 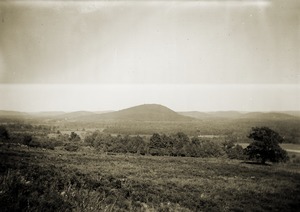 Greene, J. R., B.V. Brooks' Pre-Quabbin Photos and Postcards. Athol, Mass. : Highland Press, 2014. Processed by I. Eliot Wentworth, July 2014. 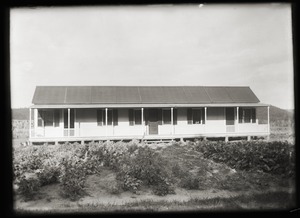 Cite as: Burt V. Brooks Photograph Collection (PH 060). Special Collections and University Archives, UMass Amherst Libraries.